Bastia is the second largest city on the island of Corsica, France. It has roughly 45,000 inhabitants. Bastia has a Mediterranean climate with temperatures during the dry and warm summer (June-August) around 27-30 °C and averages lows around or just below 20 °C. Winters from December to February are mostly around 15 °C and nights around 5-7 °C. Most of the precipitation falls from October to March and the average annual amount is about 750 mm. Bastia – Poretta Airport (BIA) offers a range of flights to other French cities like Paris and Bordeaux and international flights to London, Berlin, Hamburg and a few others. Chemins de fer de Corse travels between Bastia and Ajaccio and also to Calvi. SNCM between Bastia (Corsica) and Livorno. Corsica Ferries between Bastia and Portaferrao (on Elba). Corsica Ferries between Bastia and Savona and also Bastia and Livorno. The Société Nationale Maritime Corse-Mediterranée has a number of daily services between Bastia and Marseille, Toulon and/or Nice. 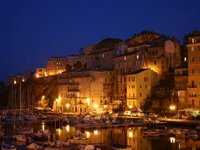 We have a comprehensive list of accommodation in Bastia searchable right here on Travellerspoint. You can use our map to quickly compare budget, mid-range or top of the range accommodation in Bastia and areas nearby. This is version 6. Last edited at 3:41 on Aug 2, 17 by sleepBot. 24 articles link to this page.